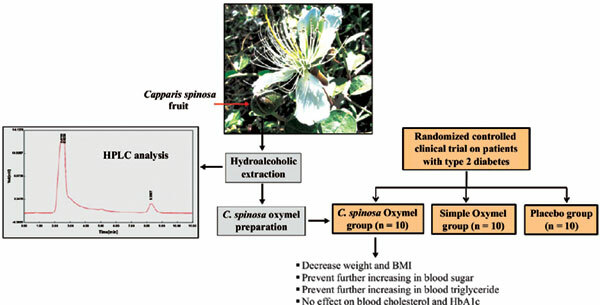 Background: Experimental studies have reported beneficial effects of Capparis spinosa L., a perennial shrub from the Capparidaceae family, on the glycemic status and serum lipids in diabetic animals. Objective: The aim of the present randomized triple-blind placebo-controlled clinical trial was to investigate the safety and efficacy of C. spinosa oxymel on blood glucose, lipid profile, and other diagnostic indexes of metabolic syndrome in patients with poorly controlled type 2 diabetes. Method: The C. spinosa oxymel was prepared by adding hydroalcoholic extract of C. spinosa fruit to simple oxymel (a mixture of grape vinegar and lactulose). Thirty diabetic patients with metabolic syndrome whose glycemic status was not controlled despite receiving full doses of oral hypoglycemic agents did not want to start insulin therapy and were randomly allocated to three groups to receive placebo, simple oxymel, or C. spinosa oxymel (10 mL/thrice daily for 3 months). All patients continued conventional therapy with hypolipidemic, antihyperlipidemic, and antihypertensive drugs during the study. Results: C. spinosa oxymel significantly decreased the body weight and body mass index at the end of the study compared to the baseline. While the patients in the placebo and simple oxymel groups displayed further increase in the level of FBG or PPBG, administration of C. spinosa oxymel inhibited the progression of hyperglycemia. Nevertheless, there was not a significant difference between placebo and intervention groups regarding HbA1c at the end of the study. C. spinosa oxymel had no significant effect on the serum cholesterol but inhibited the progression of hypertriglyceridemia during the study. There were no significant changes in creatinine, microalbuminuria, AST, ALT, and ALP values following C. spinosa treatment, suggesting that it had no unwanted effects on kidney and liver function. Conclusion: The results suggest that although C. spinosa oxymel cannot enhance the effects of hypoglycemic and hypolipidemic drugs, it can prevent further increase of blood glucose and triglycerides in patients with poorly controlled diabetes. Keywords: Caper, Capparis spinosa, diabetes, metabolic syndrome, rutin, hyperglycemia. Keywords:Caper, Capparis spinosa, diabetes, metabolic syndrome, rutin, hyperglycemia. Abstract:Background: Experimental studies have reported beneficial effects of Capparis spinosa L., a perennial shrub from the Capparidaceae family, on the glycemic status and serum lipids in diabetic animals.